I just finished up a hectic two days of photographing the Boston Marathon and events surrounding it. Previously I’ve done photo-related work for the New York City Marathon, but this was my first time covering Boston. 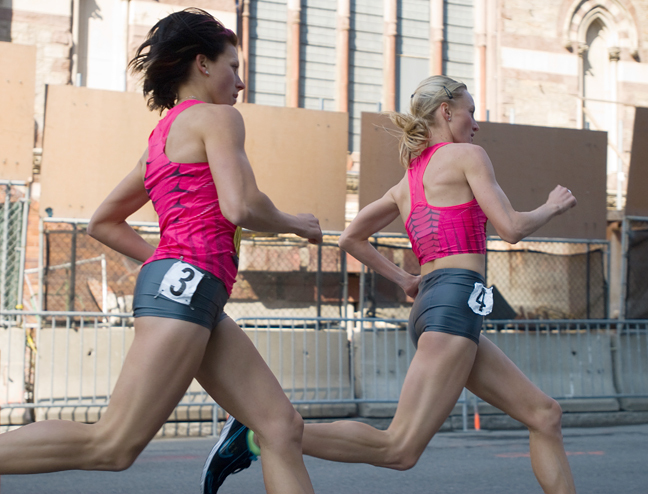 Anna Willard stayed on the heels of Shalane Flanagan, outsprinting her in the final 150 meters to win the inaugural B.A.A. Invitational Mile, held the day before the Boston Marathon. Delving into either marathon in a work capacity is like diving into a pool and holding your breath until you get to the other side. From the get go you are totally immersed in another world, one in which what is occuring outside your immediate environs matters not a whit. (A colleague called his wife on marathon Monday thinking it was Sunday and she was like “um, hello, I’m at work.”) You have a singular focus on achieving the task at hand. And just when you think your lungs might fill with water and you will never again emerge for air, the end comes and you’re relieved, satisfied, buoyed even…oh yeah, and dog tired and starving because basic human needs like sleeping and eating sort of fell by the wayside! Kara Goucher takes one last stretch before attempting to become the first American woman to win the Boston Marathon since 1985. In a very close race, she finished third, 9 seconds behind the winner, Salina Kosgei of Kenya. I certainly don’t intend this posting to be a complaint though. Being inches away from these incredible athletes and documenting their triumphs (or as case may be, failures) is a privilege. My policy when working at these types of events is to be unfailingly polite, but forceful. To get good photos, I find this combination to be key. You don’t get anywhere by being a jerk, but you definitely have to have the temerity to get in people’s faces to get good shots. And even more satisfying than good shots (well, almost…who am I kidding? What’s more satisfying to a photographer than a great shot?!) is forming bonds with people you meet along the way. Almost without fail, everyone I dealt with in Boston, from hotel workers to race officials to fans to fellow members of the press, was incredibly nice and accommodating. Take, for example, my predicament on race day. I had been assigned to cover the race’s start area and the half-way point in Wellesley. A ride had been pre-arranged to take me to the start and Wellesley, but then I was on my own getting back to the pressroom at Copley Square in Boston. The first part of the day went as planned. I got to the start and also arrived in Wellesley at a reasonable time. After initially setting off in the wrong direction on the course, I eventually located the exhuberant women of Wellesley College. The students of Wellesley College have a long tradition of cheering on Boston marathoners. Known as the Wellesley Scream Tunnel, the quarter-mile stretch is a deafening gauntlet of high fives and, of course, kisses. Here, a sophomore is taken up on her offer by an eager runner. By the time I was feeling confident that I’d gotten some good images, it was well into the afternoon. I headed toward the commuter rail to see if a Boston-bound train might be coming along soon. Naturally, as I neared the station, a train was pulling out. The next one was not for another hour and forty minutes! This would not do. While contemplating trying to find a cab on a holiday in a suburb with significant road closures, I happened upon a family heading toward a parked car. I went for it: “You’re not by any chance heading back to Boston, are you?” Well, lo and behold, yes they were. And without a second’s thought they offered to take me along. And so, I was delivered back to Boston in a timely fashion, and made some friends along the way. Then the marathon (literally and figuratively) photo editing session began. In the midst of it, a dear friend who takes care of our cats when we’re gone called to see if we’d be home in time to feed them dinner (the answer was no way) and to report that one of them was having some, ahem, digestive issues. This intrusion from the outside world reminded me that I was nearing the end of my submersion and that I could soon come up from air. Covering two days worth of events (including six races, the marathon expo, and a party) netted seven slideshows for the combined Runner’s World/Running Times marathon coverage site (not to mention numerous single images to go with time-sensitive race stories). Phew. It was a long, underwater swim, but it was worth it, much like the marathon itself, I imagine. This entry was posted in running and tagged B.A.A. mile, Boston marathon, Kara Goucher, Wellesley Scream Tunnel on April 21, 2009 by Stacey Cramp. We’re back in State College, PA, happy to have had the opportunity to meet you and find your blog. Great photos!